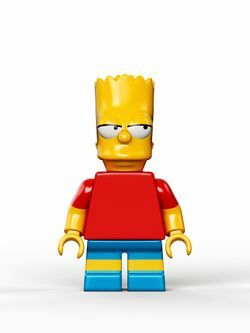 ―Bart Simpson in "Brick Like Me"
Bart Simpson, is a minifigure released in 2014 as a part of The Simpsons theme. He is the son of Homer and Marge Simpson. Bart Simpson has a specially-molded headpiece to represent his head. The yellow head is cylindrical, with hair spikes present at the top, two bulging eyes, a nose, and a neck. His shirt is entirely red, with a slingshot printed on the torso's back. The t-shirt extends onto the arms, using double-molded arms to include red sleeves and yellow arms, which continue to yellow hands. Bart's legs are short and blue, with a yellow strip in the middle, representing blue shorts and shoes. This variant of the minfigure is nearly identical to the Open Eyes variant, but with a few differences. The head mold for the minifigure has half-open eyes that are pointed to the right. Along with this, the slingshot printed on the other variant is missing on the torso's back. Bartman uses the same headpiece as the other Bart variants, but with a purple mask over the eyes and a furrowed brow. The torso of the minfigure is an orange t-shirt with a short purple cape around the neck. Double-molded arms are also used to display orange sleeves and yellows arms, with connecting yellow arms. The legs used for Bartman are the same used for the other variants, being of a short and blue manner. Bart is a spirited and creative young boy whose antics keep everyone on their toes. That’s a nice way of saying that he’s a mischievous trouble-maker with a poor attention span and impulse-control issues. But underneath that, he’s got a big heart. Probably. Sometimes it’s hard to be sure. 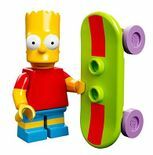 Bart Simpson Bart is a spirited and creative young boy whose antics keep everyone on their toes. That’s a nice way of saying that he’s a mischievous trouble-maker with a poor attention span and impulse-control issues. But underneath that, he’s got a big heart. Probably. Sometimes it’s hard to be sure.